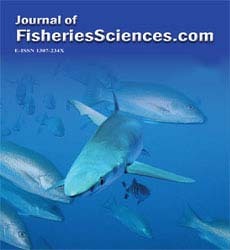 The aim of the present study was to estimate some population parameters of red mullets caught in Central Black Sea. Average length of the sampling size that is composed of 699 individuals was found to be as 11.75 ± 0.111 and their average weight to be as 17.91 ± 0.507 gr. W = 0.0107 L 2.9717 was used to estimate the length-weight relationships. Asymptotic length (L∞) among the parameters of the growth equation was calculated as 20.15 cm whereas growth coef-ficient (K) was found to be as 0.33. Survival rate (S) was 0.28, real mortality rate (A) was 0.72, natural mortality rate (M) was 0.68, fishery mortality rate (F) was 0.60 and enterprise rate (E) was estimated to be as 0.47.